To improve the flexibility of joints, some flexion, extension and stretching exercises include Chest Stretch, Wrist Stretch, Hip Roll, Head Movements etc., which helps in reducing pain and muscle stiffness. a) Walking on the lawn. b) Squats for lower limbs. a) Diaphragmatic and Segmental Breathing. b) Forward, Backward &Sideway Walking. c) Walking over the obstacles. b) Standing on one leg. Lastly, exercises are needed for hands and legs to help improve the grip like handwriting, buttoning the shirt, tying a shoelace or holding lace with toes, placing some things or arranging properly. These things are very important to make the patient independent to do carry out day to day activities or activities of daily living (ADL). Now, the most important task is to find a right physiotherapist at home or physiotherapy for Neurological disorders to recover from chronic pains, stiffness in arms, legs &hands. 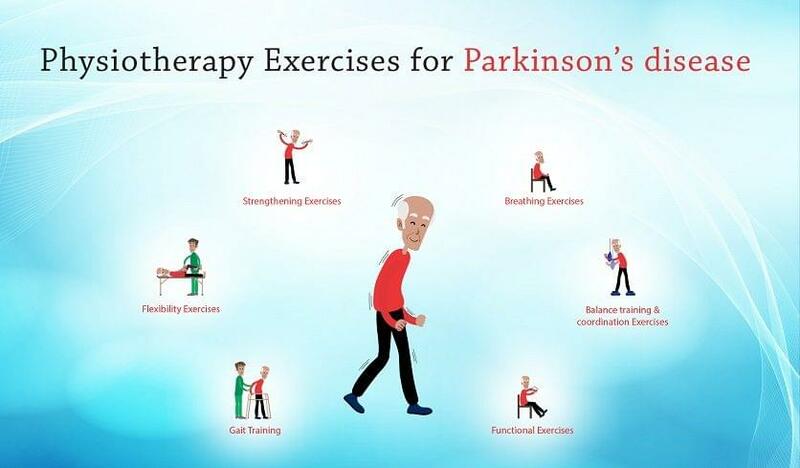 How to choose a Physiotherapist or Physiotherapy Clinic in Bangalore for Parkinson’s disease treatment and there charges? Neuro-Physiotherapist initially assesses the patient conditions based on the patient challenges and needs, then they conduct some tests and diagnose. According to the present signs and symptoms, the treatment is planned based on the patient expectations. Usually, physiotherapy treatment charges vary as per the patient condition or disease. Nowadays, it is not easy to get a lower price with quality care. The charges in the clinic will be decided based on the treatment given. Physiotherapy is charged around Rs.300/- to Rs.450/-, approximately. Home care physiotherapy treatment charges will be around 500/- to 800/-. The charges will be based on the treatment protocol. Always, select a physiotherapy clinic located in the same area or city where you live. It should be easy to travel for the patient, communicate and can save so much time. Some of the clinics offer home physiotherapy services for neurological disorder patients. Also check, the clinic is equipped with modern facilities or not and should contain all kind of physiotherapy equipment and exercise therapy needs. The suggested exercises have to be performed under supervision or with the assistance of a caregiver.